At Start Living Right, our fitness gym in Lebanon, we believe that better fitness should be within reach for everyone in the country. So, we’ve created an environment that’s friendly, supportive and motivational. We offer everything you might need to start a healthier lifestyle, and reach your fitness goals. 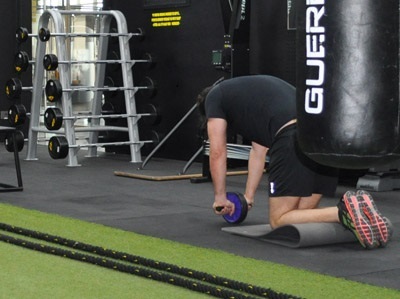 Grab one of our special discounts for personal training sessions, where workouts will be tailored to your individual needs and fitness levels. It doesn’t matter if you’re a super-fit marathon runner or a mother of 2 that hasn’t worked out in 20 years. When we give you your individual workout program and coach you through it, you can be sure that you’ll get a workout that is perfect for YOU. Ask for our special offers at the desk or by calling 76 496 999. Our Sports Nutritionist can provide you with nutrition counseling and education to enhance your fitness journey. You will be taught proper food selection and food preparation. The nutritionist will calculate your optimal nutrition for exercise training (match nutrition to training phases and goals), competition, recovery from exercise, weight management, hydration, immunity, disordered eating, and supplementation. We work with one of the best sports nutritionists and fitness specialists in Lebanon! A Physiotherapist will also be on deck to handle any problems you are facing during your workouts, and to provide help for pre-existing conditions, so that you won’t face further injuries during your workouts. Nothing will hold you back from reaching your full fitness potential! If you’re anything like me, you’ll find that maintaining your physical fitness in Lebanon can sometimes be boring, that is why, at Start Living Right, we provide classes that are both fun and will make you work up a sweat. Have you ever jumped on a trampoline for exercise? Well, with our new Bounce class you can! Other highlights include, a Power Yoga class that will shed a whole new light on what you think yoga can do for your body, Circuit Training, Pilates, Spinning, and many more of your favorites. In addition to all of the above, we offer a number of amenities to make your gym experience as easy as possible; we’re open every day, we offer free parking, you will receive a lock and towel as you enter the gym, and have access to individual showers when you have completed your workout. We also have water coolers to keep you hydrated throughout your workout! The increased awareness of the importance of fitness in Lebanon has led to a rising demand for training. Every day we are moving towards a more sedentary lifestyle and there is a great need to increase the daily activity level to maintain both body weight as well as cardiovascular fitness. So? What are you waiting for? Call Start Living Right Gym now and ask for our membership details 76 496 999! We are one of the most upcoming gyms for you to maintain your fitness in Lebanon and we guarantee that we will change your life! P.S. Don’t worry, non-members can also benefit from our monthly diet and exercise program services.